Always wanted to live in a Beautiful home at the end of a Cul-de-Sac w/amazing views? 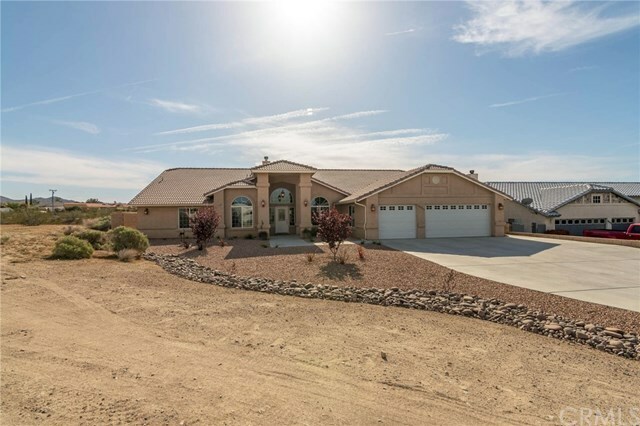 I thought so...This custom 4 bed, 3 bath, Apple Valley home has been waiting for you! Just landscaped the front yard w/low maintenance rockscape + drip system. As you enter this spacious home you are greeted w/high ceilings & tons of windows letting in natural light! You have a formal dining room + kitchen eat in area, Great Room w/built-in entertainment center & corner fireplace open to the Chefâs kitchen w/breakfast bar, island, walk-in pantry, granite counter tops, stainless steel appliances, double ovens & gorgeous cabinets. Bar area w/granite counter top & wine rack. Game Room w/pool table + built-in cabinet & pool stick holder for endless hours of fun. Office w/built-in desk & lighted shelving. Laundry room w/cabinets & sink. All bedrooms have walk-in closets. Ceiling fans thru-out. One of the guest bedrooms has door to hall bathroom. Extra storage cabinets in hallway. Master Suite has sitting area w/built-in entertainment center, lighted display cabinets & fireplace + door to back yard. Master bathroom has double sinks, jetted tub & separate tile shower w/dual shower heads. 3-car attached finished garage w/openers on both doors. Alarm system. Surround sound including thru-out the party ready covered patio. A/C units for both ends of the home + Ducted Evaporative cooler saves you money! Block-wall fencing, rain gutters & tile roof. Make your appt today to tour this fabulous home! Directions: I-15 Freeway, Exit CA-18/D Street, Go right, D Street becomes Highway 18, Left on Apple Valley Road, Right on Kamana Road, Right on Olalee Road, Left on Olalee Way to Property at end of Cul-de-Sac.